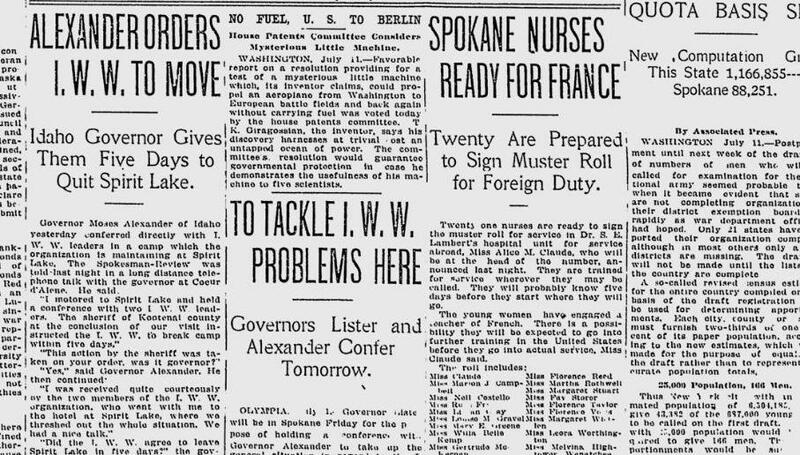 A total of 21 Spokane nurses signed up for service on the battlefields of France. They were to be part of a hospital unit organized by Dr. S.E. Lambert. “They are trained for service wherever they are called,” said Miss Alice M. Claude, who was the leader of the group. They were taking French lessons in preparation for their departure. From the Wobbly beat: Idaho Gov. Moses Alexander went directly to an Industrial Workers of the World (IWW, or Wobblies) camp at Spirit Lake to confer with the radical union’s leaders. At the end of the meeting, the governor and the Kootenai County sheriff told the men that they had to disband the camp and leave Spirit Lake within five days. The two men apparently were not willing to immediately agree to that demand, since “the man in charge of the camp was not present” and would have to be consulted. The governor evidently believed that the situation could be resolved peacefully. 1967: Rioting erupted in Newark, New Jersey, over the police beating of a black taxi driver; 26 people were killed in the five days of violence that followed.